It wasn't all that long ago that people modifying - or otherwise working on - cars were complaining about the need for a digital multimeter. Previously they'd used just a 12V test light - the measurement meant that power was either there, or it wasn't. But with the very real likelihood of the test light dragging down the voltage of the measurements being made and the requirement that voltages be accurately quantified, the need for high input impedance digital multimeters came about. These devices could accurately measure the signal without at the same time changing them - a pretty important requirement, you'd have to agree! But now the time has arrived where to know what's going on requires an oscilloscope - normally abbreviated to a 'scope'. These instruments show not only the voltage level, but also the real-time variation in that signal. The simplest example is the output of the oxygen sensor - in closed loop, it's a voltage that rapidly rises and falls. Your trusty old test light would have killed the oxy sensor output entirely, and your digital multimeter is going to get very confused when the signal keeps varying - the meter needs a steady voltage so that it can get a reading. 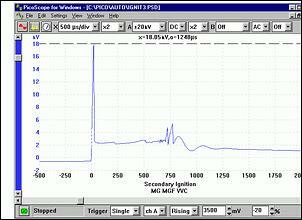 Enter the scope - it pictorially shows the changing voltage over time, drawing a trace that accurately depicts the pattern of voltage variation. In fact a scope is the only way that you're going to be able to look at signals coming out of camshaft and crankshaft position sensors, speed sensors and ABS sensors, amongst others. And it's also the only way that you're going to be able to see the signals going to injectors, idle air control valves, boost control solenoids, auto trans pressure control solenoids, and so on. Traditionally, scopes have been used by mechanics to look at primary (low voltage) and secondary (high voltage) ignition signals. And that's a valuable use for a scope. 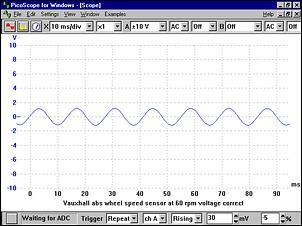 But these days a scope is far more likely to be used to look at inputs and outputs of the ECU. In fact, most good factory workshop manuals now show sample scope traces, so that you can use a scope to quickly find if the output signal from the sensor or ECU looks as it should. Think about this: if in a modified car you're changing those signals by using an interceptor, just how good a job is the interceptor doing? Does the waveform going into the interceptor from the crankshaft position sensor look like the intercepted waveform coming out of the modifier (except of course for a change in timing)? Or is the output waveform horribly distorted - perhaps the cause of that Check Engine light problem that always rears its ugly head when you have the interceptor working? Or what if you want to make a modification in an area that few other people have played with - for example, change the auto trans pressure for firmer shifts? These days it will be controlled by a pulsed solenoid - but actually seeing how the solenoid is pulsed in different conditions will require a scope. In this three part series we'll start with the basics of scopes. Getting your head around a signal that's constantly varying can be quite hard to do, especially when most of us are used to reading relatively unchanging values on a multimeter. After that we'll look at what scopes are suitable for automotive work, then we'll get stuck into using a scope on modified and standard cars. Much of the following section is closely based on XYZs of Oscilloscopes by Tektronix. Tektronix [http://www.tek.com] is a well-respected manufacturer of high quality digital and analog scopes. 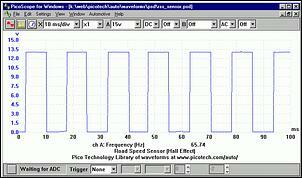 The automotive scope waveforms are from Pico Technology. Pico Technology [http://www.picotech.com/auto/] manufactures automotive scope adaptors that work with laptop PCs. An oscilloscope is basically a graph-displaying device - it draws a graph of an electrical signal. In all automotive applications, the graph shows how signals change over time: the vertical (Y) axis represents voltage, and the horizontal (X) axis represents time. The generic term for a pattern that repeats over time is a 'wave' - sound waves, brain waves, ocean waves, and voltage waves are all repetitive patterns. 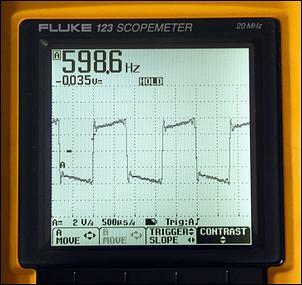 An oscilloscope measures voltage waves. One cycle of a wave is the portion of the wave that repeats. 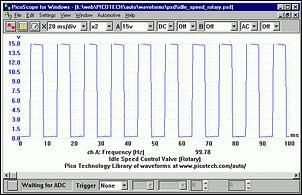 A waveform is a graphic representation of a wave. A voltage waveform shows time on the horizontal axis and voltage on the vertical axis. Waveform shapes reveal a great deal about a signal. Any time you see a change in the height of the waveform, you know the voltage has changed. Any time there is a flat horizontal line, you know that there is no change for that length of time. Straight, diagonal lines mean a linear change - rise or fall of voltage at a steady rate. Sharp angles on a waveform indicate sudden change. 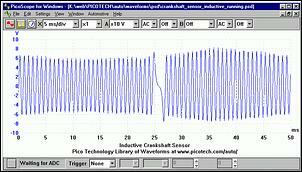 In automotive applications, sine and square waves dominate. 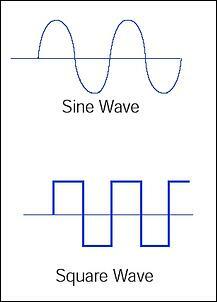 The sine wave is the fundamental wave shape. It has harmonious mathematical properties - it is the same sine shape you may have studied in high school trigonometry class. Mains AC voltage varies as a sine wave. ('AC' signifies alternating current, although the voltage alternates too. 'DC' stands for direct current, which means a steady current and voltage, such as a car battery produces.) Many speed sensors produce sine wave outputs - this waveform is from an ABS inductive speed sensor. The square wave is another common wave shape. Basically, a square wave is a voltage that turns on and off (ie goes high and low) at regular intervals. An injector waveform is fundamentally a square wave - the injector is either on or off. A rectangular wave is like the square wave, except that the high and low time intervals are not of equal length. That is, the 'on' and 'off' times are not equal. Again, this is often the case with an injector, where at low loads the 'off' time will be much longer than the 'on' time. The waveform shown here is from a Hall Effect road speed sensor. 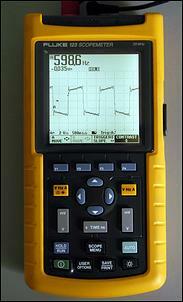 Many terms are used to describe the types of measurements made with an oscilloscope. If a signal repeats, it has a frequency. Frequency is measured in Hertz (Hz) and equals the number of times the signal repeats itself in one second. Hertz can also be referred to as 'cycles per second'. 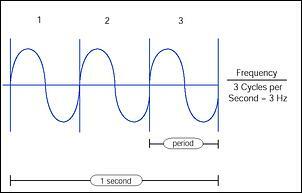 A repetitive signal also has a period - this is the amount of time it takes the signal to complete one cycle. Period and frequency are reciprocals of each other, so that 1/period equals the frequency and 1/frequency equals the period. For example, the sine wave here has a frequency of 3 Hz and a period of 1/3 second. Some scopes can calculate frequency and display it as a standalone number, while in other cases the period needs to be read off the scope screen and the frequency then calculated from this. 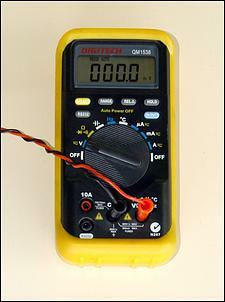 Voltage is the amount of electric potential - or signal strength - between two points in a circuit. Usually, one of these points is ground, or zero volts. DC signals are measured on a scope as you would with a multimeter - from ground to the amplitude (height) of the signal. Automotive AC signals are often measured from the maximum peak to the minimum peak of a waveform, which is referred to as the peak-to-peak voltage. The peak-to-peak voltage of this inductive crank sensor is just under 16 volts. 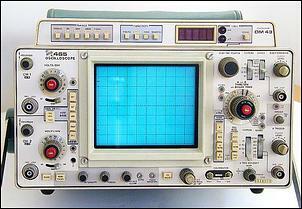 Oscilloscopes can be classified as analog and digital types. An analog oscilloscope works by applying the measured signal voltage directly to the vertical axis of an electron beam that moves from left to right across the oscilloscope screen - usually a cathode-ray tube (CRT). The back side of the screen is treated with luminous phosphor that glows wherever the electron beam hits it. The signal voltage deflects the beam up and down proportionally as it moves horizontally across the display, tracing the waveform on the screen. Analog oscilloscopes are characterised by the large screens used in traditional 'tune-up' machines and the smaller scopes with the glowing green screens used in electronics. They are excellent tools, however in automotive use they suffer from major drawbacks - the need for mains power, the greater difficulty in set-up and the absence of a storage mode that allows the freezing of the on-screen image. A digital oscilloscope uses an analog-to-digital converter (ADC) to convert the measured voltage into digital information. It acquires the waveform as a series of samples, and stores these samples until it accumulates enough samples to describe a waveform. It then re-assembles the waveform for display on the screen. The digital approach means that the oscilloscope can display any frequency within its range with stability, brightness, and clarity. It can also easily freeze the waveform, allowing it to be studied at leisure. Digital scopes can usually be powered by batteries and use an LCD screen. All scope adaptors that are used with laptop PCs are digital. a) The attenuation (reduction) or amplification (increasing) of the signal - use the volts/div (volts per on-screen division) control to adjust the height of the signal to the desired measurement range. b) The time base - use the sec/div (seconds per on-screen division) control to set the amount of time per division represented horizontally across the screen. c)The triggering of the oscilloscope - use the trigger level to stabilize a repeating signal, or to trigger on a single event. These adjustments sound more complex than they actually are: what you want to see is a steady waveform that fits on the screen. The first point (a) simply fits the waveform on the screen vertically, (b) sets the bottom axis so that the waveform repeats sufficiently that you can recognise it, and (c) makes sure that the waveform is clearly depicted. And as we said, some digital scopes have an 'auto' button that do all of these things for you! The oscilloscope is primarily a voltage-measuring device. The most basic method of taking voltage measurements is to count the number of divisions a waveform spans up the oscilloscope's vertical scale. Adjusting the volts/div control signal to allow the signal to cover most of the screen vertically makes for the best voltage measurements. The more screen area you use, the more accurately you can read from the screen. Then it's as simple as reading off how many divisions per volt the scope is set to, and estimating on-screen how many divisions the waveform covers. 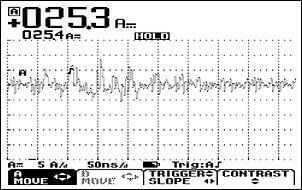 With AC signals (eg a sinewave from a speed sensor), you would normally look at the peak to peak voltage. With a DC voltage, the whole line will be elevated from the zero point. Some scopes will do these calculations for you. You can make time measurements using the horizontal scale of the oscilloscope. Time measurements include measuring the period and pulse width of pulses. Remember that frequency is the reciprocal of the period, so once you know the period, the frequency is one divided by the period. Like voltage measurements, time measurements are more accurate when you adjust the portion of the signal to be measured to cover a large area of the screen. Again, some scopes will do these calculations for you.